A map done for October's Monthly Cartography Contest run by Krall and I over at Sufficient Velocity. Hope you all enjoy! In 1680, the Puebloan Revolt began in what would be the most successful Native American revolt in New Spain. Led by Tewa religious leader Po'Pay, the rebels killed around 400 Spanish and drove the rest of the settlers from the province, particularly around the capital of Santa Fe. In our world, the duration of Nuevo Mexico being free from Spanish settlement lasted but 12 years. Here, instead, Nuevo Mexico remained largely free of the Spanish until the Spanish Bourbons took control of New Spain. In response to the rebellion and the failed military expeditions to retake Nuevo Mexico, the Bourbons instead began a series of reforms to the colony and the other Spanish New World colonies, pursuing policies geared towards federalism and a light government touch on matters of economy and religion. Not nearly as much as the British colonies on the latter, but a real change from the Habsburgs. More specifically, the Puebloans were allowed their place in the colony so long as Santa Fe and other Spanish settlements remained Catholic. It wasn't perfect, but it was enough. The new policies and general success of the Spanish Bourbons led to successful 18th century for New Spain and the Spanish colonies in the New World while the rest of the world seethed and fought the first intercontinental wars. The world as a whole remained relatively unchanged from our own as events in far off colonies did not do much to change the forces of history so much as gently guide it. The first real major changes came at the end of the 18th century and the beginning of the 19th. The young United States devoted itself far more to the ideas of Jefferson while in Europe the Napoleonic Wars resulted in a somewhat different outcome. Napoleon was still defeated, in time, but with less help from Prussia and more from Austria who took the chance to advantage themselves over their rival. Spain faced many problems in the war and a number of refugees fled to Mexico, including revolutionaries. It was not long before Mexico, like the United States, strained for independence, which was gained in the 1820s under an imperial government. The new government took a strong federal stance to better manage some of its more far off territories, from Costa Rica to Alta California and especially Nuevo Mexico. The empire had its stumbling blocks and at times seemed ready to come apart at the seams, but managed to hold itself together through a growing and prosperous 19th century in which Mexico expanded its borders, its population, its economy, and its own national myths to create a structure that could withstand the worst forces on the inside and outside. Rebellions, ultra-conservative attempted coups, crackdowns on Native peoples only leading to revolt, and more were weathered in time by a solid and stable government based not just upon the emperor but upon the elected officials as well. This in stark contrast to the United States who weathered two civil wars to emerge as the more stable and centralized (and somewhat ironically named) Federal States of America. Mexico and the British were not slow to use the opportunity to claim parts of Orejon for themselves. The 20th and 21st centuries only expanded the prowess of the Empire of Mexico, though not without growing pains. Economic downturns, political chaos, and wars that covered the world were all difficulties faced by the great empire, but were weathered by a resolute people who began to celebrate their cultural and religious diversity, especially as native peoples in the provinces of Arizona, Nuevo Mexico, and Tejas made their voices heard. Though not as influential over such vast areas, these people carved out for themselves religious, linguistic, and cultural areas that to this day remain influential in the cultural melting pot that makes up northern Mexico. None are more influential in the local provincial culture, however, than the Puebloan peoples. Despite many hardships faced, these peoples survived since the rebellion of Po'Pay to firmly establish themselves as part of Nuevo Mexico and make their own places in Taos, La Luz, Zia, and more into prosperous towns and cities that embody the rich and diverse culture of the province. 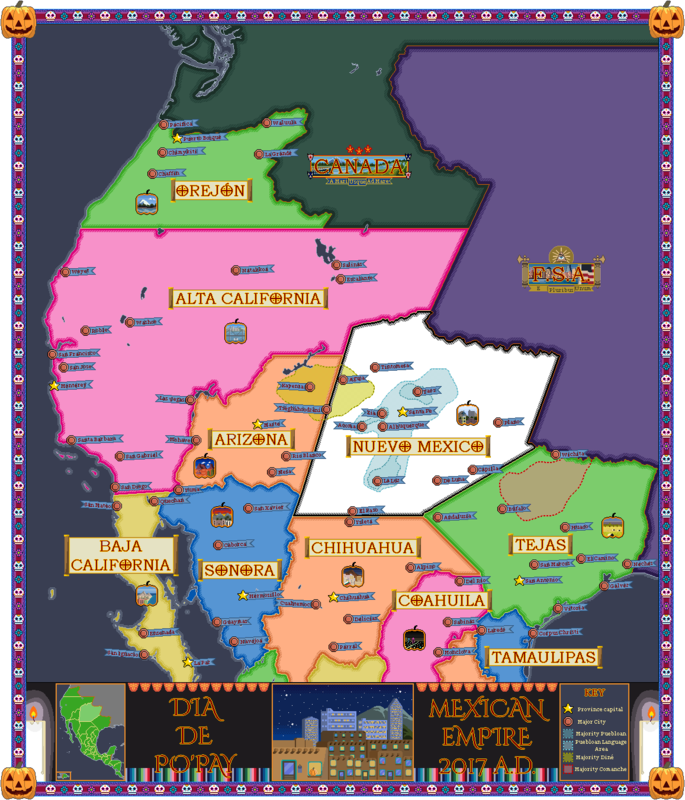 So diverse is the province that in the 1980s the Mexican Imperial government designated the province as the Plurinational Province of Nuevo Mexico (Provincia Plurinacional de Nuevo Mexico) in order to recognize the many kinds of nationality and culture that exist within the massive province. That is not to say Nuevo Mexico is the only interesting place. All of North America has begun to enjoy a prosperous and stable 21st century. Northern Mexico has begun to see the fruits of transitioning into a post-industrial economy with technology, information, service, and other fields sprout from the cities of Chihuahua to the quiet forest towns of Orejon. Alta California and Tejas continue to be two other diverse and eccentric centers of mexican arts and culture as they both continue to transition from petroleum-based energy industries to green energy with solar and wind power becoming vogue. Central America, long prosperous provinces of Mexico, has led the world (only tied by the FSA) in agricultural technology and innovation as the rich volcanic soils provide bountiful harvests. Canada stretches from sea to sea as a kingdom in its own right--though still linked to Britain--and with the addition of more of the Pacific Northwest now has two poles around which its population orbits. The nation is world renowned for its quiet living, friendly people, and fattening foods. The FSA, though having a rough start to the 20th century, made a big finish and has come into the 21st at the top of its game. The government is generally a centre-left coalition that focuses on technological solutions to problems and international politics. The right city lights and growing job market have begun to attract people from all over the world to the nation. The three main nations of North America have even moved forward on ideas to create a common market between them all. Time will tell what will come of that, and indeed what will become of the everyday people who make up the nations. What is sure, on this Hallow's Eve in Mexico, the future is a bright one and the whole continent teems in anticipation of what is to come. And so, from the people of Nuevo Mexico, the Mexican Empire, and myself, have a wonderful and bright Halloween!